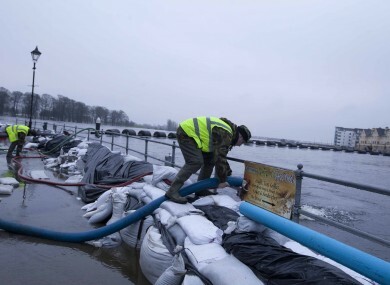 Sandbags at the River Shannon, Athlone. THE EUROPEAN COMMISSION has said any suggestion EU environmental rules are to blame for the recent severe flooding in Ireland is “completely without foundation”. In a statement released today, the commission said: “EU law does not ban dredging. The water framework directive (WFD) and the floods directive do not include detailed rules on how member states manage their water courses. That is decided by the member states themselves. Yesterday, independent TD Michael Fitzmaurice criticised President Michael D Higgins, noting that when he was a minister in 1997 he signed the EU habitats directive into law. “It is that very directive that is preventing a lot of badly needed dredging and drainage work on rivers and streams around the country that would have prevented the very floods that [the President] will be inspecting,” the Roscommon South Leitrim TD said. One solution that would prevent a lot of flooding in areas all around the country would be to dredge and clean up rivers and streams and ditches. However the habitats directive which was signed into law by Michael D Higgins in 1997 prevents a lot of that work going ahead. and that should be remembered today. The President visited flood-affected areas in Galway and Wexford yesterday. He said a balance needs to be struck between environmental concerns and the need for flood relief. In its statement, the commission said EU nature directives “do not prevent measures being taken to protect lives and property”. The institution said these rules provide for situations of “over-riding public interest” that to permit activities that might damage natural sites but are “necessary for human welfare”. However, they do require “an assessment of the options available before a conclusion is reached that such damage is unavoidable”. Dredging is not always the solution for flooding. It may help to sort out a local problem but it may also transport the problem downstream, sometimes from rural to urban areas where the damage on properties and economic activities can be much higher. Therefore the basin-wide approach included in EU policies is essential to find effective and long-term solutions. The commission added that Ireland will receive almost €705 million from 2014-2020 for investments in climate change adaptation and risk prevention. Email “EU to Ireland: We're not stopping you from dredging ”. Feedback on “EU to Ireland: We're not stopping you from dredging ”.